Full-service engineering for a new 13,000 sq. ft. outpatient clinic. The building space program included general and psychiatric examination rooms, ophthalmological and audiological examination and treatment suites, clinical laboratory, physicians’ and administrative offices, nurse station, staff support and public areas. 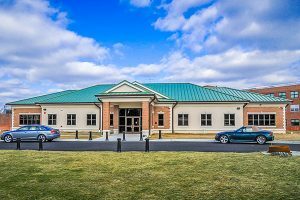 The new building was designed using a Building Information Model (BIM) created in Revit and meets LEED Silver certification criteria.